Serafina Restaurant Group was created by Vittorio Assaf & Fabio Granato in 1995 when the two opened up Serafina Fabulous Pizza. Following the success of the first location, they have opened up Serafina Fabulous Grill, Serafina Osteria, Serafina Broadway & Serafina at the Time Hotel, all in New York City. Serafina Restaurant Group also founded Geisha in New York, and Geisha House in Los Angeles, and other restaurants around the world. Serafina is a New York City hotspot. All locations are always buzzing with people wining and dining. A lot of celebrities dine at Serafina such as Lady Gaga, Cameron Diaz & A-Rod, Kim Kardashian & many more. It is also NBA player Sasha Vujacic’s favorite restaurant. I went to Serafina Fabulous Grill on 29 East 61st Street between Park & Madison. It is so charming and cozy- when you walk in right away it feels like you’ve been transported to Italy and you are far away from the hustle and bustle, tall concrete skyscrapers and crowded streets of New York. Serafina Fabulous Grill is a three room restaurant with a charming terrace in the back, main dining room with an open fire grill & cherrywood burning oven, and another dining room with a lively bar. Their website couldn’t have said it better: “Serafina Fabulous Grill attracts a diverse clientele that makes the restaurant both a happening social scene and an extension of its neighbors’ kitchens and dining rooms”. 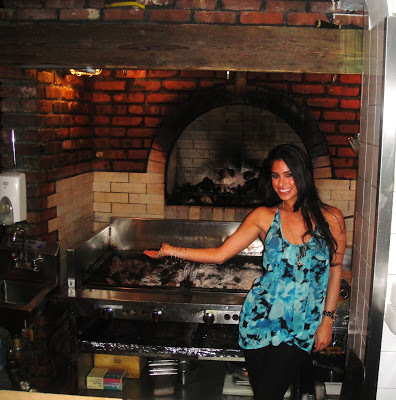 Me in front of the brickstone oven where they cook the pizza! ~La Paglia & Fieno Del Sud- Homemade, green & white fetticine with a light tomato sauce, basil, Parmesean, & a touch of cream. This is their “specialty” pasta. The manager of the restaurant recommended it, saying it was the house favorite and they were famous for it, so obviously I wanted to try it. It was good, but nothing to write home about. It was missing a kick. It wasn’t bad at all, it was good- just wasn’t amazing. ~Custom made pizza with grated cheeses, buffalo mozzerella, cherry tomatoes, & thinly-cut proscuitto- MMMMMMM! *The Manager and Chef came out and brought out complimentary desserts for us! I was in HEAVEN! All were unbelievable. ~La Panna Cotta made with fresh vanilla from Madagascar- So good! Love Panna Cotta. This was light & delicious. ~Il Tiramisu- One of the best Tiramisu’s! Creamy on top, and the cake was so fluffy and fresh with great flavor. YUM. ~Berry Tart- This was my favorite. I literally devoured this. The custard filling was creamy & amazing, the fresh crust was buttery & crispy, & the fruit was so fresh and sweet. It was the perfect dessert. I have to go back and get this again! I will be back to Serafina again. Such a cozy, charming, feel-good Italian restaurant. Perfect for any occasion. For all locations check their website! Leaving Serafina. Great dinner with friends! The tiramisu looks delicious! I enjoyed reading your blog, where does it all go, the food I mean, even when you say you’re full you still look fabulous! I’d probably roll over and be in a food-induced coma 🙂 Keep em coming!